Where can I buy an IKEA gift card? 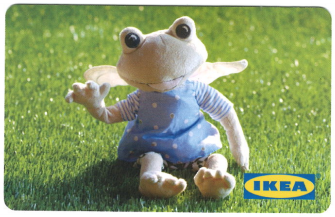 IKEA gift cards are on sale at the tills/customer services desk at your local IKEA store. Click here to find your nearest store. You can purchase an IKEA gift card online to be sent to you or directly to the person you want to give it to. https://www.voucherexpress.net/ikea When we checked there were postage charges as follows: Under £50 gifts (£2.00), between £50 and £100 (£2.95) and over £100 (£5.50). You can’t currently spend IKEA gift cards on the IKEA UK website, we’ll update this page if that changes. IKEA gift cards that have a value in £ sterling can also be used overseas. IKEA gift cards can be redeemed in Australia, Austria, Belgium, Canada, Czech Republic, Denmark, Finland, France, Germany, Hungary, Ireland, Italy, Japan, Netherlands, Norway, Poland, Portugal, Russia, Slovakia, Spain, Sweden, Switzerland, United Kingdom & USA. There are a couple of exceptions: the Adelaide and Perth IKEA stores don’t accept the gift cards, and IKEA’s stores in the Canary Islands on Lanzarote, Tenerife, and Gran Canaria also don’t take the gift cards.